Malin Court Hotel is located near Turnberry on the Ayrshire Coast, and offers a high standard of accommodation and cuisine in beautiful surroundings nestling between coast and rolling green countryside. The hotel is also unique as it incorporates a highly regarded care home offering a wonderful caring environment. We have been privileged to work with the team at Malin Court over a number of years to provide web design for this excellent hotel. Our objective was to provide a clean, clear and highly usable web site which enabled customers to easily find information about the hotel and place a booking enquiry. The hotel’s previous site was rich in information but the design was dated, so we had a clear task to improve the presentation and ease of use. In collaboration with the staff at Malin Court, we were able to integrate the existing content with the new design. Valuable information was previously hidden in pages dense with text and therefore we were keen to really showcase the hotel’s services, from accommodation to restaurant to weddings along with special and seasonal offers. This was successfully achieved with a number of pleasing and engaging user interface elements such as tabs for menus, slideshows and sliders, wrapped up in a modern responsive design. We also updated photography and general presentation to maximise the effect achieved from the available content. We hope this will work well in driving customer engagement and lead to more enquiries and bookings for the hotel. 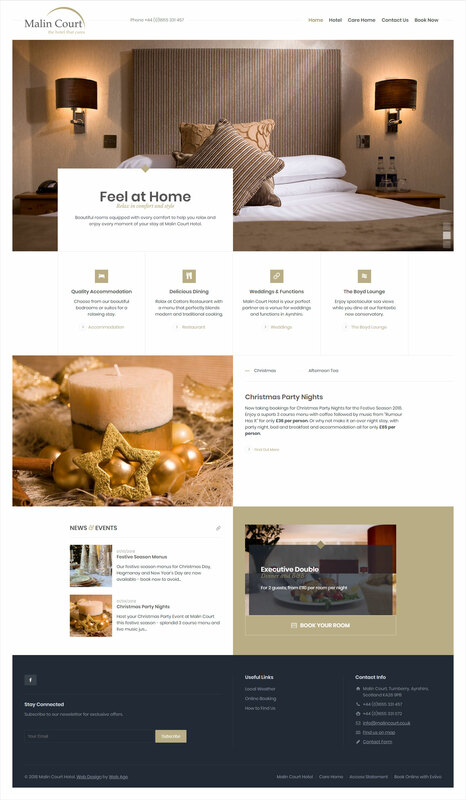 Please do check out the site at https://malincourt.co.uk/ or contact us to enquire about web design or development for your hotel. We are familiar with a number of common hotel booking or reservation systems and have extensive expertise of integrating diverse APIs with websites on many platforms.